The Mickey Pylon is a well-known landmark in Celebration, Florida, a master-planned community just outside of Walt Disney World Resort in the Orlando-Kissimmee Metropolitan Statistical Area. Connected directly to the parks, the community was developed by the Walt Disney Company. Stay in a room with a view... of the bottom of the ocean. The ruins of a creative scholar's fantastical unfinished sanctuary act as his massive gravestone. 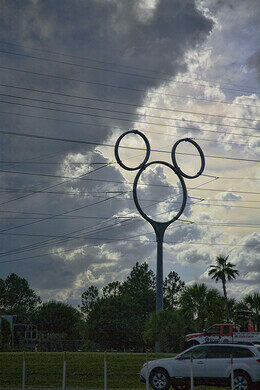 The Mickey Pylon is a 32 metres tall double-deadend tubular powerline tower in form of a stylizied Mickey Mouse used to feed nearby Osceola Substation with two 230 kV circuits, one coming northward over Gaylord Palms Resort from the Intercession City Power Plant and the other coming southward from the Pearce Road Substation. The Mickey Pylon consists of a 21.3 metres tall tubular pole, on which a circular ring with a diametre of 9.1 metres and a weight of 13.608 tons is installed for the head. At this ring two eliptical rings with axis lengths of 5.5 and 6.1 metres and a weight of 2.495 tons are installed, representing the ears. All ring structures consist of galvanized steel tube with a cross section of 0.305 m x 0,508 m, manufactured by Bend-Tec of Duluth, Minnesota, USA. At night, the structure can be illuminated by fibre-optic cables installed on the rings, which are fed from a laser installed at the ground through a telecommunications-grade fiber mounted inside the pole. Disney World's very first waterpark is now an abandoned ruin being reclaimed by the swamp. Disney's abandoned animal island is now an overgrown ruin that was almost the coolest attraction ever. After the attack on Pearl Harbor, rocks and fossils from every U.S. state were collected into a pyramid of national unity. A museum preserving one company’s history of preserving food. This charming fountain honors Felix Salten, the creator of the iconic storybook deer. The Tudor-style cottage in the middle of the square is not quite what it seems. It is still illegal to "quarrel" at this unlikely urban oasis built on top of an electrical substation.